In the industries regulated by FDA compliance issues are of great importance. When disputes arise, the regulatory compliance status of a product or facility is often a key issue and can make a significant difference in how the matter will be resolved. In such cases, it is critical to have the assistance and advice of experts who are both experienced and knowledgeable in FDA regulations and industry practices, and who will be perceived as independent and objective. Whether a dispute is resolved via mediation or litigation it is imperative to have a well-respected and knowledgeable expert witness acting on your firm’s and client’s behalf. 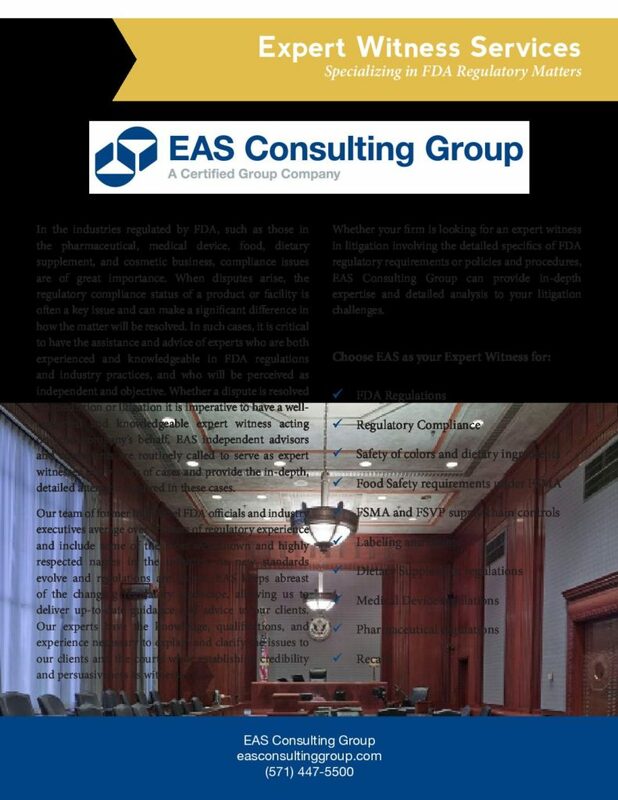 EAS independent advisors and consultants are routinely called to serve as expert witnesses in a variety of cases and provide the in-depth, detailed attention required. Our team of former high-level FDA officials and industry executives average over 25 years of regulatory experience and include some of the most well-known and highly respected names in the industry. As new standards evolve and regulations are issued, EAS keeps abreast of the changing regulatory landscape, allowing us to deliver up-to-date guidance and advice to our clients. Our experts have the knowledge, qualifications, and experience necessary to explain and clarify the issues to our clients and the courts while establishing credibility and persuasiveness as witnesses. Agencies, judges and juries, want to hear from well-respected and knowledgeable expert witnesses. The need is there, whether the issue is recalls, labeling claims, safety audits, or almost any other challenge to a facility or a product. A good expert witness is not just a person with wisdom about a topic, the expert must also be able to communicate to, connect with, and convince the decision maker. It is not easy to find experienced experts who are more than just a great resume, however, EAS provides consultants who can become part of your legal team, writing expert opinions, participating in depositions or being called to the stand as your expert witness. If EAS can be of assistance as you prepare for your next litigation or mediation challenge, please reach out to me directly. I will personally assure that EAS will match the specific needs and requirements of your case with an expert whose knowledge and experience enhances your client’s legal standing. 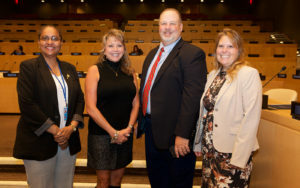 EAS Consulting Group is honored to announce that Dean Cirotta, EAS President and COO, was an invited key speaker to the September 29, 2018 Fourth Session of the SIDS DOCK Assembly – the Sustainable Energy and Climate Resilience Organization, at the United Nations Headquarters in New York City, to discuss EAS regulatory capabilities in support of 32 small islands and low lying nations seeking to export US Food and Drug Administration (US FDA) regulated raw material ingredients and products into the United States. Speaking to Her Excellency Ms. Keisha A. McGuire, Esq., Ambassador and Permanent Representative of Grenada to the United Nations, and the newly-elected Chair for the SIDS DOCK Island Women Open Network (IWON), who sat interim for the newly-elected President of the Assembly, His Excellency Dr. The Right Honourable Keith C. Mitchell, Prime Minister of Grenada; His Excellency, Dr. Albert Binger, Secretary-General of SIDS DOCK; His Excellency Mr. Ronald Jumeau, Ambassador and Permanent Representative of the Republic of the Seychelles to the United Nations and newly-elected Chair of the SIDS DOCK Executive Council; Her Excellency Ms. I. Rhonda King, Ambassador and Permanent Representative of St. Vincent and the Grenadines to the United Nations, former Chair of the SIDS DOCK IWON, and the newly-elected Seventy-Fourth President of the United Nations Economic and Social Council (ECOSOC), and other distinguished delegates and special guests in attendance, Mr. Cirotta discussed EAS’s capability and capacity to support the Island Nations and specifically the Island Women Open Network’s (IWON) Herbal/Botanical initiative with an understanding of and compliance assistance with FDA export and sales requirements of herbal and botanical ingredients and products into the US and other global regions. The SIDS DOCK IWON Pilot Initiative on Developing a Successful Natural Products Industry: Quality, Claims, Cyber and Intellectual Property, is the signature project for the SIDS DOCK Organization, and is being coordinated by Ms. Heather Fairman, SIDS DOCK IWON Advisor and Technical Coordinator for the Herbal/Botanical Project, who has 30 years of experience in the industry. Ms. Fairman, who also serves as an Independent Consultant for EAS, saw the tremendous value that EAS’s unique regulatory and scientific expertise and knowledge could provide in support of the development of the industry for the SIDS. As such, Ms. Fairman was responsible for introducing and orchestrating EAS’s partnership with the SIDS DOCK organization. Of keen interest to the Assembly was Mr. Cirotta’s explanation of EAS’s specialization in US FDA regulatory matters with a prime focus of assisting domestic and foreign firms with compliance to the applicable US FDA laws and regulations. He went on to highlight that EAS is staffed with former FDA compliance and inspection officials and industry executives and is assisted by a global network of 150 independent consultants, hand-chosen for their expertise in a variety of technical areas. According to Dr. Al Binger, Secretary General of the SIDS DOCK, “EAS ‘s unique consulting capabilities as described by Mr. Cirotta to include “facility registrations, product listings, label reviews, test methods review and development, ingredient acceptability, new ingredient evaluation and approval, the development and implementation of quality systems to meet FDA Good Manufacturing Practices (GMPs), along with the appropriate training from “farm to fork” and the preparation for foreign FDA inspections”, can be considered as part of the recipe for success for the Herbal/Botanical project in small island states.”. 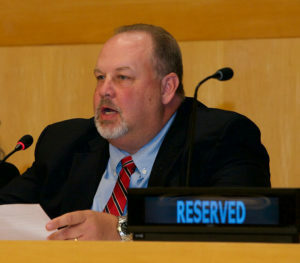 Dean Cirotta was accompanied at the U.N. by EAS Senior Director for Dietary Supplement and Tobacco Services, Tara Lin Couch, Ph.D. who oversees EAS’s Quality Control efforts in dietary supplement and tobacco manufacturing facilities including the establishment of specifications and the development of well-organized, sophisticated laboratories. She assists numerous companies with the development, improvement, and implementation of strong Quality Systems that are scientifically sound, efficient, practical, and compliant with all FDA regulations. For more information on EAS Consulting Group visit www.easconsultinggroup.com.